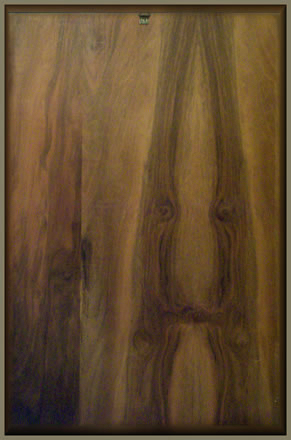 December, brings us yet more beautiful examples of wood inlay work taken from the Buchschmid and Gretaux catalogue. The example seen at the top of this page in particular makes a nice use of some very exotic veneers. The second picture down is a different story entirely. It is almost an 'escapee' from the Buchschmid and Gretaux workshops and is a very rare work. Herr. Otto Chlup himself provides the story behind this very special picture, so, scroll down the page and read this intriguing story for yourself, it is an amazing insight into the Buchschmid and Gretaux story. December's updates brings us some more Buchschmid and Gretaux works not previously seen in these pages. 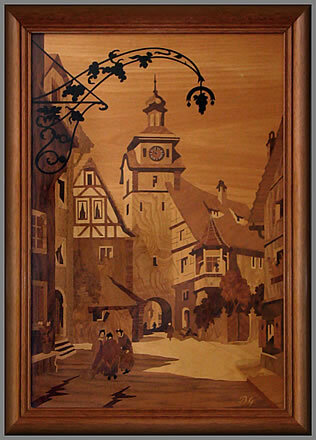 The first one you see here is titled "Rothenburg White Tower" and is owned by Marc Kroeks. 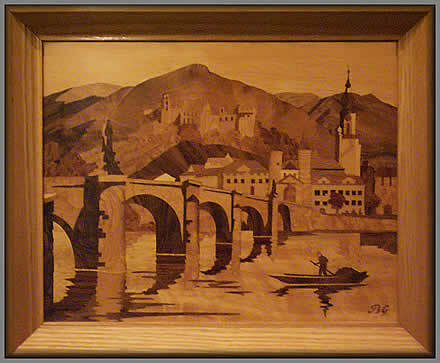 It is a beautiful example of the Buchschmid and Gretaux wood inlay work; and from close observation, uses a goodly percentage of burr (or burl) veneers. The burrs (or burls) are highly prized veneers and originate from the "warts or carbuncles" that sometimes form on various trees. Those 'warts' are completely random and often supply us with some really beautiful random and wild grain patterns. As would be expected with any work by B & G, those burrs/burls have been used to wonderful effect in Marc's Rothenburg picture. A very nice piece of work. The next picture you see here is a unique discovery by Chris Lefevre. This picture differs from the usual style of Buchschmid and Gretaux; it is not listed in their catalogues or production lists. At first we were unsure about this one, but, it did have the BG logo in the bottom left hand corner, and so it was probably a true example of their work. As we could not offer any information about this picture ourselves, we enlisted the help of our good friend Otto Chlup to see what he could tell us about this interesting piece. "The picture seen here has its origins back in the early 60's and the theme of it relates to Gretaux being highly influenced by the film "Exodus". Gretaux was very affected by this film and in consequence of his feelings he commissioned myself (Otto Chlup) to produce three design drawings of the central theme of the film's main story to be used as templates for three wood inlay pictures. The first of these designs was of the family wandering through the forest (this is the picture seen here) - the second one is called "To New Shores" and touches on the theme of immigration - and the third is taken from the stand point of a person wandering through a forest. Gretaux or myself did not really have any particular titles for pictures numbers one and three; only number two had a title as such. Numbers 1 & 2 are still hanging in my (Otto's) own workshop. Unfortunately Gretaux was not too happy with the "modernistic" design since it did not fit with the other classic subjects for a wood inlay. 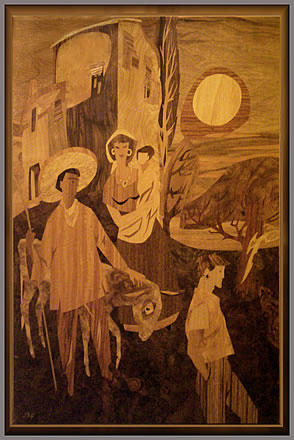 These were therefore the only examples he cut, or desired to cut, of such subjects for wood inlay work. I (Otto) respected his wishes and these modernistic designs were never commercially produced." Thanks for that information Otto. Obviously, it seems, pictures like this one are extremely rare and subsequently very desirable. We have no idea of the market value of such pieces as, being very rare, they, of course, don't turn up at auction in sufficient numbers to be able to gauge an average selling price for them. However, if you do own one of these works, you have something very few others have got! Yours is a wonderful and possibly unique work that other collectors will undoubtedly envy and love to own themselves! Chris's other picture here is the smaller and slightly different version of the Heidelberg picture you will find on page 7 of this series. 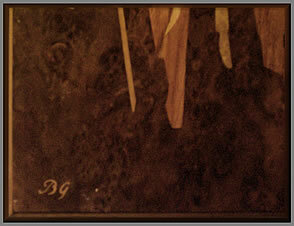 The Buchschmid and Gretaux wood inlay company did often make differing sizes of a favourite composition. This one is a superb example of that practice. It is interesting to note the small differences. The theme transfers well to the smaller size. Click the above button to return to page 14 of "Can You Help"
Click the above button to visit page 16 of "Can You Help"